Heroes, Heroines, and History: Let's Go to the Diner! Let's Go to the Diner! Have you ever been to a diner? These nostalgic restaurants were popular from the 1920’s to the 1950’s, but today’s fast food restaurants replaced them. Some of you may remember the diners in TV shows like “Happy Days” and “Alice.” Norman Rockwell’s 1958 painting, The Runaway, shows a young boy and a protective highway patrolman at the counter of an anonymous diner. In 1858, Walter Scott of Providence, Rhode Island, began selling sandwiches and coffee to night workers. His business grew so well that in 1872, he quit his day job and started selling food from a horse-drawn covered express wagon, credited as being the first diner. Soon, others copied his idea and set up wagons that served workers and pedestrians at night, since most restaurants were closed by 8:00 p.m. When the wagon vendors joined the lunchtime business, their inexpensive, fast meals gained popularity, and the wagons began to crowd the streets. Towns and cities passed ordinances to restrict their hours of operation. This prompted some owners to park their wagons in semi-permanent location to circumvent the law. 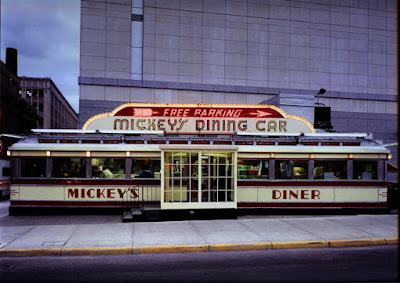 As horse-drawn street cars were replaced by new electric ones, wagon vendors bought the old cars and converted them into diners. 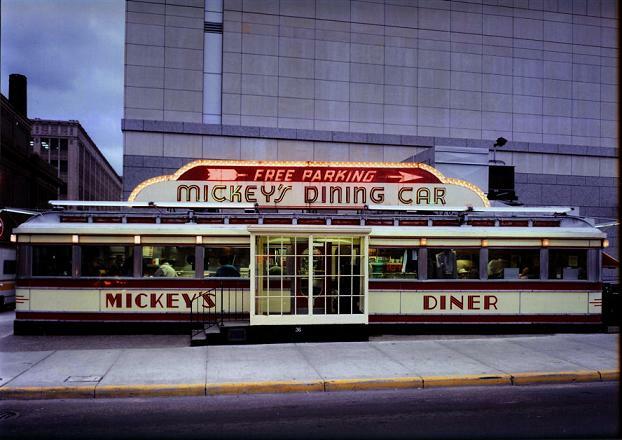 During this time, diners gained the reputation of “greasy spoons,” and many were open 24 hours a day. After women gained the right to vote in 1920, diner owners began to clean up their image to attract the women’s business. They spruced up their businesses with a fresh paint, added flowers and shrubs outside, and booth service inside. Diner menus typically featured American classic fare like hamburgers, French fries, and sandwiches. In addition, many served hand-blended milkshakes and desserts like pies, displayed in glass cases. Prefabricated diners entered the scene in the 1920’s with innovations such as indoor bathrooms, tables, and longer dimensions. The 1930’s saw more streamline versions, made to symbolize speed and mobility. Diners maintained their popularity during the Depression because they offered inexpensive places to eat. After World War II, the demands for diners increased. Servicemen eligible for G.I. 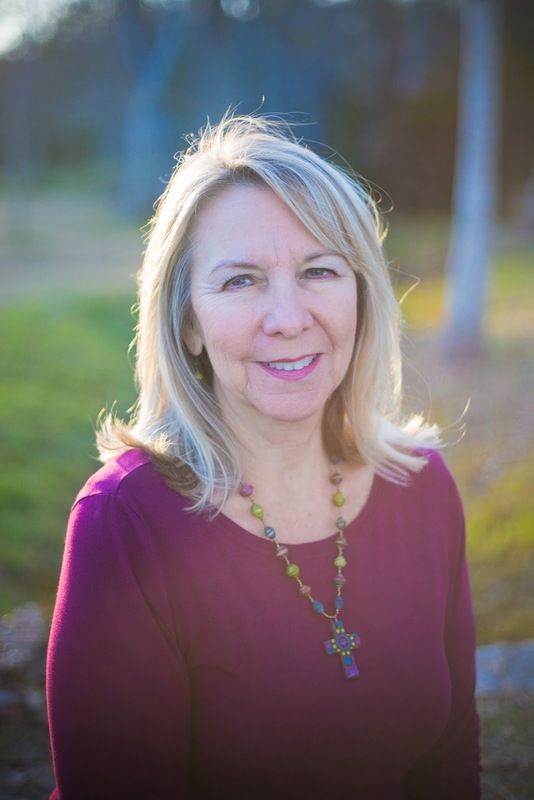 loans saw diners as an easy way to make an income. In 1948, a dozen diner manufacturers competed for business. New materials such as Formica, Naugahyde and terrazzo floors made their entrance into diner design. All stainless steel exteriors and large windows were added to attract motorists as populations became more mobile. The introduction of new fast food restaurants caused diners to lose popularity during the 1960’s until a revival began in the late 1970’s. Interest in the American diner continues today. 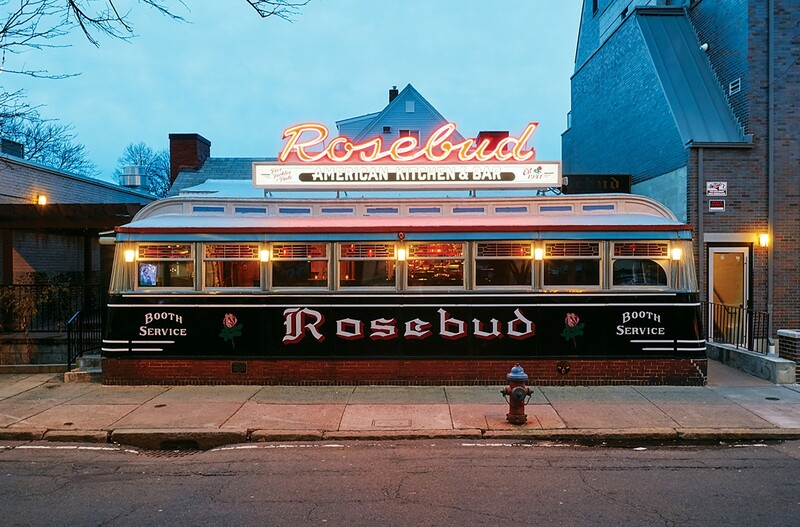 People intent on preserving the diner atmosphere where people from all walks of life gathered for inexpensive meals prompted a number of vintage diners to be rescued from demolition and relocated to new sites. 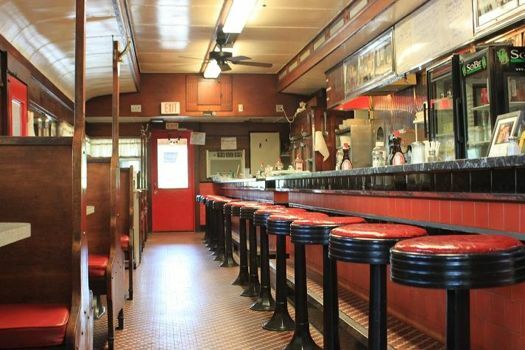 The Massachusetts Historical Commission has placed all vintage functioning diners on the National Register of Historic Places. 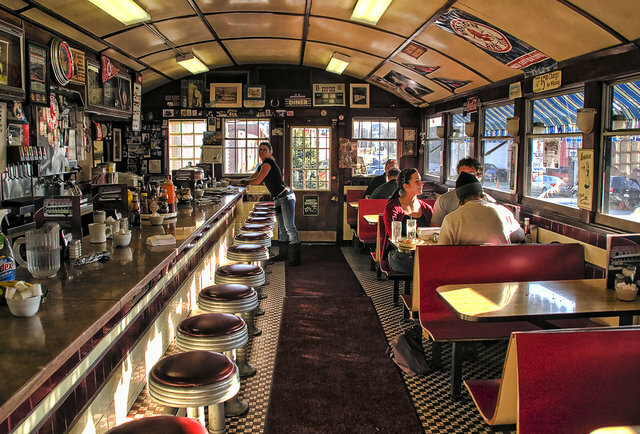 Did you have a favorite diner? What did it look like? What was your favorite food there? Love this post! We have been to several diners that fit your description of railroad car-type structures in VT, NH and Maine. We also try to find the "diners" that are small restaurants that you would probably call "holes in the wall", the food is usually pretty good. My rule of thumb is that if the tables aren't greasy, I'll try it at least once!!! I think I have only been to two diners in my entire 28 years--Lloyd's that is located in my hometown in Northern NY and the South Side Soda Shop in Goshen, IN. I love the Soda Shop--classic '50s decor. http://www.southsidesodashop.com/ They're pies are to die for! 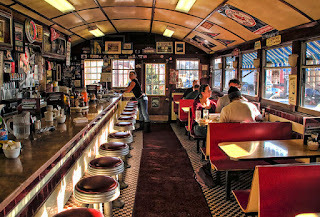 Loved the pictures of these diners--the nostalgia of the stools and interiors. I enjoy eating at the smaller ma and pa's restaurants than big chain ones when traveling. If there are cars there you assume the food is good.